Do you care about being liked at work? Do you think likeability should even play a role in business decisions? If you’re struggling to answer these questions, you might be confusing ‘likeability’ with being considered ‘nice.’ The two are not the same thing. 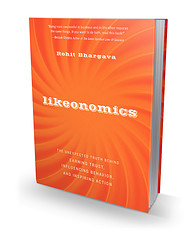 In his latest book, Likeonomics: The Unexpected Truth Behind Earning Trust, Influencing Behavior, and Inspiring Action, Rohit Bhargava explains that likeability has nothing to do with being nice, and everything to do with being believable. Nike makes some of the best products in the world—products that you lust after. But you also make a lot of crap. Just get rid of the crap and focus on the good stuff. Jobs didn’t play nice, but he had the type of honesty and clarity of vision that drew people to him, made him believable and even likeable, in his own way. If you want to learn how to be more likeable and build a thriving career or business, Likeonomics is the best investment you’ll ever make. Here’s what you need to know about the book. 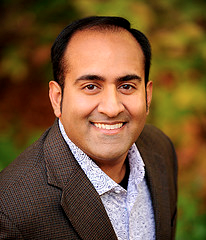 Rohit Bhargava, author of Likeonomics. Likeonomics tackles what the author considers to be the biggest crisis in business today: ‘believability’ (or trust). It’s the absence of trust that makes it hard for businesses to succeed, for people to find or keep a job, or for anyone to believe in anything. Rohit argues that in order to be more believable and more trusted, businesses need to be more likeable. The gist of Likeonomics is how people and organizations lose trust and how they can get it back! Unlike previous books I have reviewed here on Social Media Examiner, Likeonomics is the first book that that has little to do with social media. It’s actually a business version of How to Win Friends and Influence People by Dale Carnegie. Likeonomics explains why we have a deep need to be liked, what it really takes to be likeable and how building great relationships with others translates into exponential business success! Marketing spin and actual lies—for every nutrition label that declares something that the product is not (e.g., “all natural,” “heart healthy” or “lose 14 lbs. in 14 days!”), consumers’ faith in truth dies just a little. When companies lie to us by hiding the truth and these lies turn into scandals, we lose trust in them in a big way (e.g., The Barclays Bank CEO pay scandal). Facelessness and Corporate-Speak—when messages come from large companies with which we have no personal connection, we are less likely to believe them. 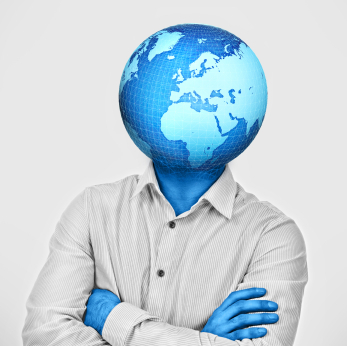 Faceless organizations and people are nearly impossible to like, let alone believe in. Think of the IRS or TSA. Volume—Consumers today are bombarded with anywhere from 3,500 to 5,000 marketing messages per day (according to marketing firm Yankelovich). When message volume increases so enormously, we have no choice but to start in a default state of distrust. Consider how many unopened emails you have in your inbox right now. Consumer Protection—The very nature of consumer protection involves educating consumers to be savvier. Ironically, this education also leads them to be suspicious about everything (e.g., this California Man Is Suing Apple Because Siri ‘Doesn’t Know What She’s Talking About‘), and to automatically distrust organizations whose messages (they believe) are designed to manipulate them in some way. And so it is with business. Entrepreneurs who are so results-driven that they forget what consumers really want display a flawed understanding of how the marketplace works. So what do consumers want? In April 2009, two rogue Domino’s employees filmed themselves doing crazy things with a pizza they were about to deliver to a customer. They then posted that video on YouTube. Soon after that, CEO Patrick Doyle apologized, but it was too late. Pizza sales began to decline as the media picked up on the viral video. The usual marketing solution would have been to let the storm pass and then load up on discounts or some other ‘genius’ campaign to save the day. It was real, it was human and it got people to start to reconsider Domino’s. Within the first quarter of running the new ads, sales increased by double digits and the company announced a net income growth of 10.6%! Takeaway: People respond to human companies in human ways, and sometimes the most human thing you can do is admit an inconvenient truth. It inspires loyalty and trust. Customers respond to brands that reach out to them in unselfish ways. The good news is that Twitter has turned out to be one of the most powerful tools for businesses to do exactly that. Back in 2011, some of the world’s largest brands gathered together at the Useful Social Media Summit in New York City to figure out how using social media might result in better customer care (apparently no-one knew how this worked). As the summit progressed, marketers began to realize that those brands that had focused on building relationships by creating the most engagement on Twitter were the ones who were seeing the most successful customer experiences. They weren’t just answering customer questions or complaints on Twitter, they were also proactively answering questions that customers hadn’t asked them directly (Twelpforce Best Buy does this). And while this would have been very creepy on the phone, it was welcomed and celebrated on the social web! Takeaway: Twitter allows brands to connect with consumers by offering a useful point of view that helps customers with their problems. Sure, it’s time-consuming and may not always result in financial gain, but marketers who want to create deeper customer connections should converse unselfishly with their customers both on- and offline. There’s a reason why Google has religiously resisted the temptation to put anything on their home page save for a text box and a search button. It’s the same reason why customers around the globe appreciated Steve Jobs. His true brilliance showed in the way he created things that were simple enough for a child to use. Customers want simplicity because it eliminates confusion and leads to more trust. For example, take a look at this SlideShare ‘napkin presentation‘ by Dan Roam explaining in stunning simplicity how the U.S. healthcare system works. When you can simplify an idea, product or service, it becomes clearer, easier to remember and easier to do. Simplicity can come from reduction. Find a product designer who can remove all of the layers or activities that don’t matter and focus on the essence of the thing. The power of visual thinking and drawing pictures instead of just using words is a perfect way to simplify ideas and make them more widely understood. Relevance and timing are two other key principles of likeability that Rohit discusses, but I don’t want to give away everything here, so I’ll let you read about those yourself. If you’re a B2B brand, you need to know that there are many people who perceive your category as being aloof and unapproachable. But don’t worry, Rohit will show you what to do. If you’re not in B2B, you might think that you’re likeable by default, and that all of your customers simply love you. But are you sure? Why not find out, because you might actually be missing something. You might also think that using social media makes you suddenly likeable. The fact is many companies make unlikeable social media mistakes every single day. While there are easy ways to make your content more likeable, this book will help you nail it. The book (and the author!) are super-likeable and that makes me think, if there’s anyone who knows something about likeability, it’s Rohit Bhargava. After all, his personal mission is to bring humanity back to business. It doesn’t get more likeable than that. Social Media Examiner is pleased to give this wise and wonderful book a full 5 star rating.